Last night’s Postwar and Contemporary Sale at Sotheby’s, New York easily outmatched their rival Christie’s sale the night before with a total of $134,438,000 and only 2 lots unsold. While 59% of works sold over their pre-sale estimates, it was Andy Warhol‘s 200 One Dollar Bills, which sold for $43,762,500 over an estimate of $8-12million, that catapulted the total sales revenue way over the initial estimate of $67-97 million. Untitled, Jackson Pollock. 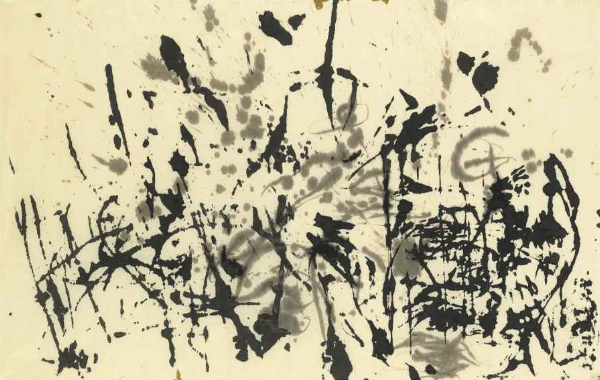 Sold for $2,882,500 – a new record for a work on paper by Pollock. Californian Art Dealer, David Hockney. Sold to the fashion designer Valentino for $5,458,500. Consumer behaviour has started to accelerate after May 2009 and with Sotheby’s estimates made in May/June/July this year, it seems works were priced conservatively and not for a market in the mend. 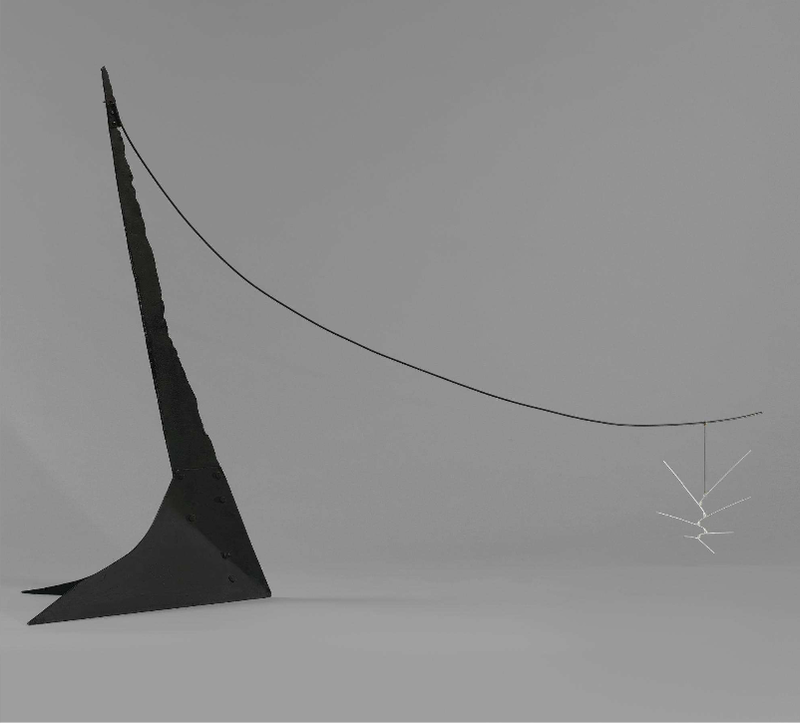 Extreme Cantilever, Alexander Calder. 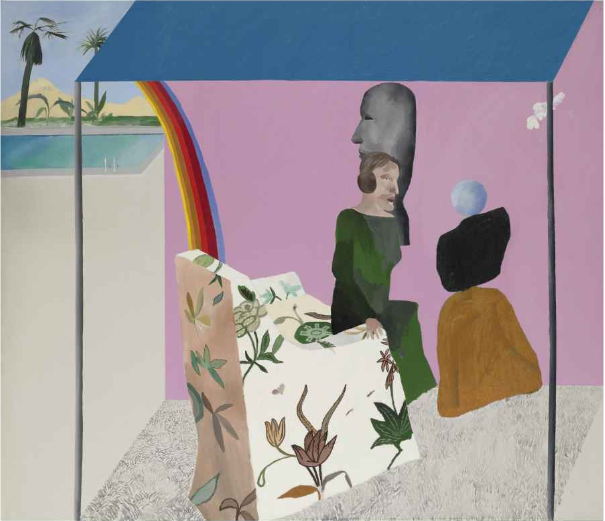 Sold under estimate for $842,500 to Jeffrey Deitch. Once part of the celebrated collection of Robert C. Scull, Warhol’s 200 One Dollar Bills has been unseen since it was sold after the taxi tycoon’s death in 1986. 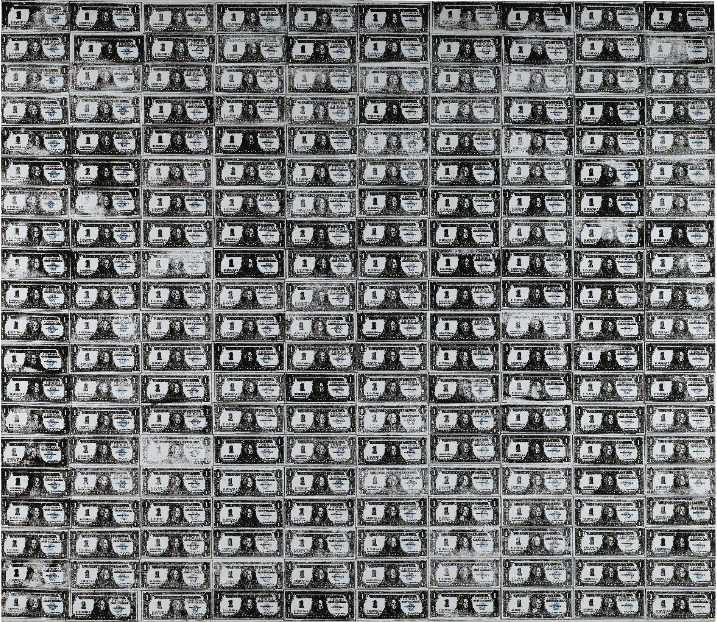 One of the artist’s first silk-screen paintings, The Dollar Bill series consisted predominantly of small paintings of single dollar bills, with only 10 paintings of dollar bills done in serial or group formats, 200 One Dollar Bills and 192 One Dollar Bills (collection of Staatliche Museen zu Berlin, National galerie, Collection Marx, Berlin) are the two largest paintings – one a horizontal format and the other a vertical. The rare nature of this painting, as well as its significance in the canon of Art History made this a greatly anticipated work. Few were prepared for the ferocious bidding that occurred – bidding opened at $6million and immediately a telephone bidder doubled that figure to the figure that had initially been the high-end estimate. Many in the room, including New York dealer Phillippe Segalot and “the man with 800 Warhols”, Jose Mugrabi, tried to outdo persistent telephone bidders. Eventually the winning bid came through Bruno Vinciguerra – Sotheby’s chief operating officer. Not only is $43,762,500 the second highest price for Warhol at auction, but it also makes 200 One Dollar Bills the 25th most expensive artwork to ever sell at auction. At Christie’s Post War and Contemporary sale the night before, there was great disappointment when one of the top lots, Warhol’s Tunafish Disaster, failed to sell. Lastnight, by way of Larry Gagosian, Sotheby’s offered a similar composition from the same series – while under the initial estimate, Sotheby’s succeeded to shift their Tunafish Disaster to Jose Mugrabi for $1,202,500. There was great excitement on the sale floor for Warhol’s of all kinds – a 1962 sketch of a roll of cash was bought by Larry Gagosian for $4.2million over pre-sale estimate of $3.5million. Like Christie’s offerings from the property of John Cage and Merce Cunningham, works from the property of two great American collectors opened Sotheby’s auction with great speed. Mary Schiller Myers and Louis S. Myers cultivated relationships with contemporary artists and a small, trusted group of dealers during their lifetime – the couple bought smartly and with conviction for forty years resulting in an unsurpassable collection of contemporary American and European pieces. The collection itself brought-in a total of $24million. The most impressive sale from the Myers collection was its second lot; Alice Neel’s double portrait, Jackie Curtis and Rita Red, which fetched $1,650,500 – a price that smashes the previous record for the artist. Bidding for this picture came from all over the world. 2 Museums fought very hard for this picture. 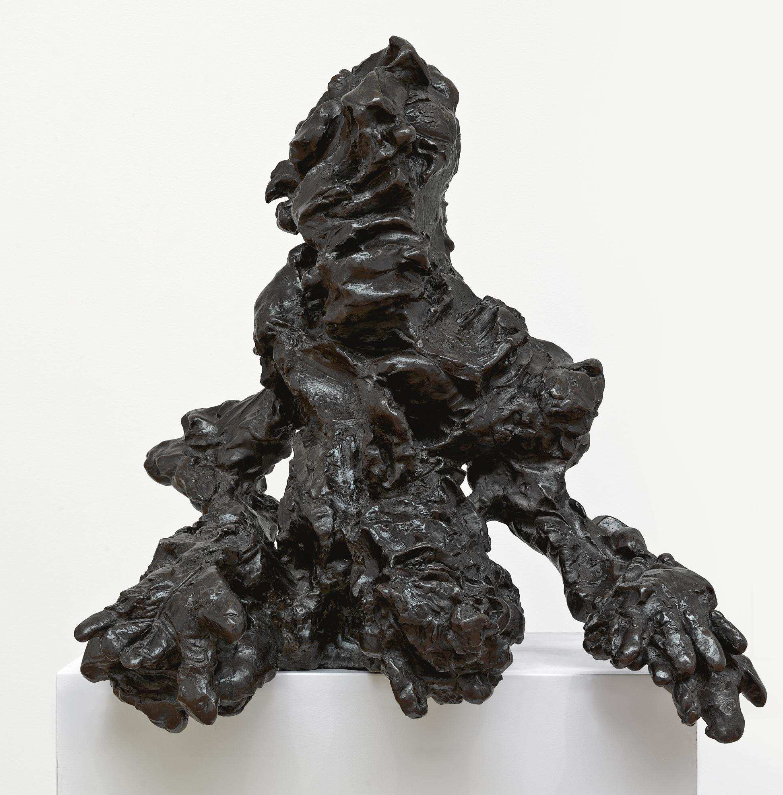 Another record came from a female artist featured in this collection – Germaine Richier – whose bronze figure sold at $842,500, over double its high estimate of $300,000. These not the only records to come from the Myers collection; a new record for Willem de Kooning sculpture was achieved by Large Torso which sold for $5,682,500 – well over the previous record of $3.9million. The sculpture was originally bought by the Myers in 1980 from Xavier Fourcade; lastnight it was purchased by Robert MaClean. 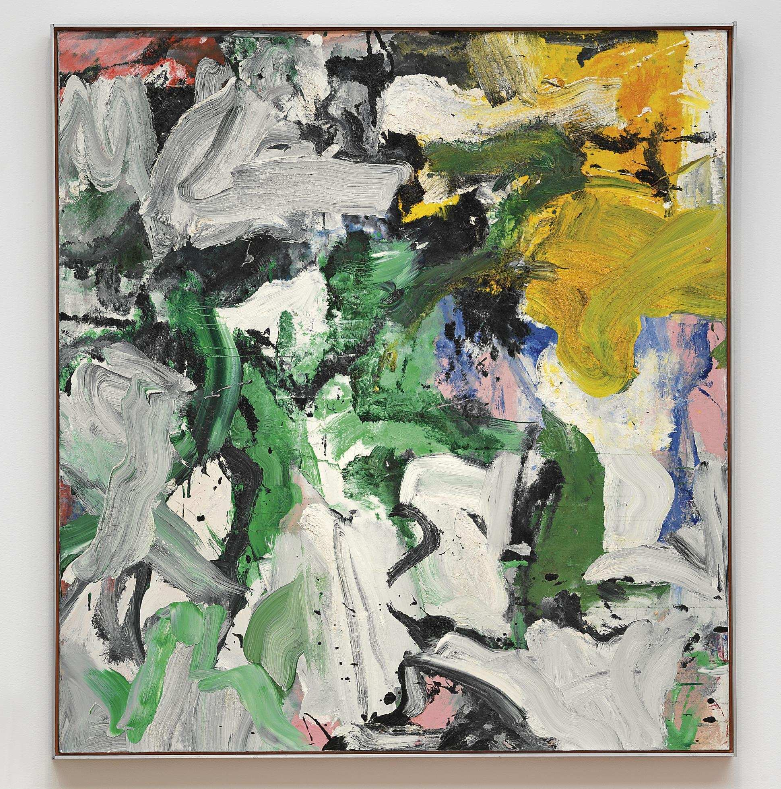 There was further interest in de Koonings from the Myers collection: Untitled XV, a painting dating from the mid-1970s, perhaps the most prolific period of de Kooning’s career, was brought $6,130,500. Orange, Red, Orange by Mark Rothko from the Estate of Lucie Moreira Salles had not appeared on the market for more than 30 years and fetched $3.4million after a heated contest involving six bidders. Donald Judd’s copper Untitled also exceeded expectations when it reached $1,650,500 against a high pre-sale estimate of $1.2 million. Tonight is Phillips de Pury‘s turn to auction their selection Contemporary works; ArtObserved will be on site to report and twitter all happenings as they happen on. This entry was posted on Thursday, November 12th, 2009 at 12:15 pm	and is filed under Art News. You can follow any responses to this entry through the RSS 2.0 feed. You can leave a response, or trackback from your own site.